Synopsis: The movie depicts a zombie outbreak in an isolated army camp. 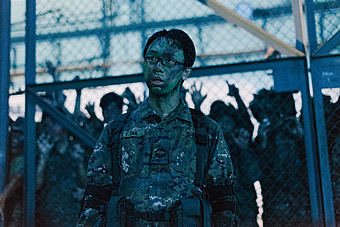 Corporal Tan Kayu (Alaric) is a lazy soldier doing guard duty during his mandatory reservist when a mysterious virus breaks out and turns his campmates into rabid zombies. 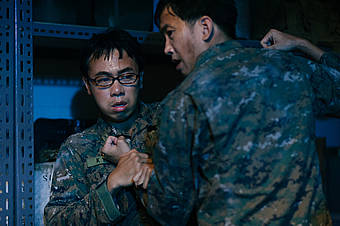 Trapped together, Kayu must team up with his arch-rival, the tough Sergeant Lee Siao On (Benjamin Heng), to survive. Cut off from the outside world, their military training is put to the test and they must find out what it means to be real soldiers. 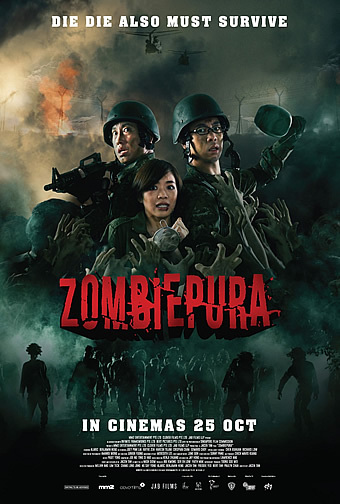 So Singapore finally has a zombie movie to call its own, and we’re proud to say that ‘Zombiepura’ is a hilariously entertaining horror comedy that is uniquely Singaporean. No other genre entry has had the inspiration to unfold a zombie outbreak within the confines of an army camp, but then again, there are few countries within which military life is such a keystone of its national identity. 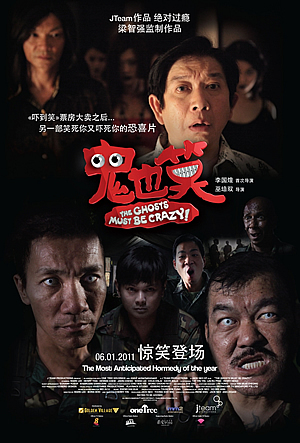 It was while serving his duty to nation that first-time feature film director Jacen Tan got the inspiration for this movie, which probably explains how steeped in National Service (NS) routines, archetypes and customs it is, aside from being a movie where a bunch of people try to outrun, outlive and outwit a horde of flesh-eating zombies. The pre-opening credits scene sets the tone for what is to come – an overweight soldier is squatting in a clearing in a forest, taking a dump in the middle of the night, when he is scared shitless (pun intended) by rustling in the undergrowth that turns out to be a zombie in army fatigues. Oh yes, those who have been through NS will immediately recognise that familiar scene from outfield; ditto the weariness of meeting a ‘siao on’ regular who thinks that In-Camp Trainings should be as ‘garang’ as full-time serviceman (NSF) days, that is captured ever so sharply and succinctly in the subsequent scenes which establish our two simply-named main characters – Corporal Tan Kayu (Alaric Tay) and Sergeant Lee Siao On (Benjamin Heng). 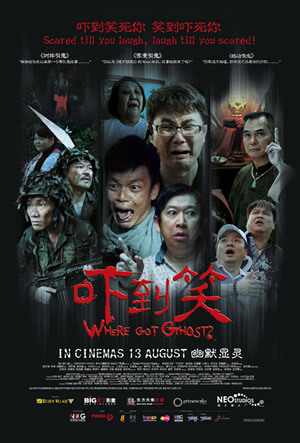 It is with complete respect to the ins and outs of our NS life that Tan has conceived this movie, but with tongue firmly in cheek that he pokes fun at certain familiarities – whether the common malingering excuses that Corporal Tan encounters at the medical centre while there to ‘report sick’; or the commonly bandied maxims of surviving NS like ‘act blur live longer, act stupid live forever’; or even the classic personas within the army camp, exemplified here by the fierce Regimental Sergeant Major ‘Mad Dog’ Lee (Richard Low), the ‘white horse’ medical doctor Captain Yap (Edward Choy), the ‘old chio’ canteen auntie Susie (Chen Xiuhuan), and her attractive daughter Xiaoling (Joeypink Lai). Within these established settings, Tan imagines what would happen in the face of something as unprecedented as a zombie attack. Wisely, Tan confines the backdrop to a single army camp and the events to within a single day, whereupon Corporal Tan, Sergeant Lee and Xiaoling are challenged to exercise ingenuity, wit and courage to escape the rest of the soldiers-turned-zombies. 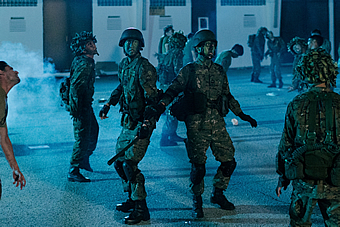 Both Corporal Tan and Sergeant Lee will be tested in their own ways – whereas Corporal Tan has to overcome his cowardly tendencies, Sergeant Lee will have to get in front of the army SOPs that he is familiar and comfortable with. At the same time, the trio will also have to confront the usual selfish suspects, typified here by Captain Yap and his associate Corporal Chua (Rayve Zen), who have no qualms sacrificing who they need to in order to survive. 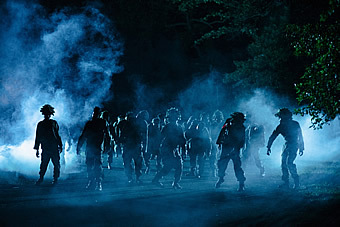 Frankly, at slightly less than one and a half hours, there is little plot in the movie to speak of; in fact, the movie comprises largely of four extended sequences – first, the medical centre where Patient Zero is brought in from outfield and spreads the zombie virus; second, a storage facility behind roller shutters holding zombies at bay where our trio engages in a tense confrontation with Corporal Chua and Captain Yap; three, a room with army stores where they share a pivotal emotional moment and prepare for a showdown with the zombies; and four, the do-or-die showdown dubbed ‘Operation Crazies’ in full battle order on the camp’s parade square. But the script, co-written by Tan and Nash Siow, has just enough detail and character definition to sustain the film, which is ultimately anchored by the spot-on performances of its leads Tay and Heng. Tan has described how both actors were involved in scripting the movie with him, and it shows in how well Tay and Heng grasp their respective characters, even if the character arcs in the story could be sharper. There is an infectious verve in their back-and-forth, especially in how Heng’s domineering Sergeant Lee struggles to assert his authority over Tay’s nonchalant Corporal Tan when things go south and his consequent exasperation. Lai plays her role as complement to Corporal Tan and Sergeant Lee nicely, and holds her own as the resourceful female who proves to be even braver than her two male companions. The rest of the veteran supporting cast are expectedly solid, but the extras playing the flesh-hungry zombies deserve special mention for their admirable commitment in keeping the horror real and present. 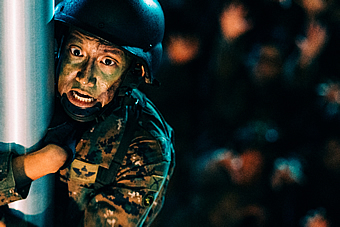 If at first the idea of a zombie movie set in an army camp seemed odd, we have to say that Tan has made it work surprisingly well; probably most inspired is how he gently satirises the strict adherence to NS routines through the habits of the zombies, due to so-called ‘muscle memory’. Tan also carefully balances the level of self-awareness in his movie, avoiding going completely self-aware as a spoof would but with occasional ‘wink-wink’ references (e.g., ’28 hours later’). Like we said, this is a Uniquely Singaporean take on the genre, such that some of the references to NS life will be lost on someone unfamiliar with it. But we were genuinely amused and entertained by its unique blend of NS and ‘zombie movie’ tropes, and let’s just say we’re more than thrilled for another helping of ‘Zombiepura’ that the epilogue teases.